Imagine a show that incorporates all the elements of a classic 1950's Vegas floorshow of The Rat Pack era with the a West End show of today and you have an idea of what The Craig McMurdo Floorshow in theatres is all about. 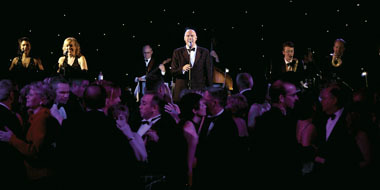 Glamorous and breathtaking production numbers, stunning vocal harmonies, the hottest swing band in the UK all led by the sensational voice, humour and charm of the highly charismatic Craig McMurdo. There is simply no other act in Europe to match it.